Ocean Tracks addresses a world that is rapidly changing. Over the past few decades, the amount of digital, sharable scientific data has grown exponentially and this trend shows no signs of slowing. Analyzing data, spotting patterns, and extracting useful information have become gateway skills to full participation in the workforce and civic engagement of the 21st century. Yet classrooms are falling short in preparing students for this world. Perhaps more importantly, they are missing a widely recognized opportunity to harness the power of big data to transform student learning in exciting ways. Ocean Tracks is at the forefront of a movement defined by a broad desire to raise a generation of students with a greater understanding of science and scientific practices, and with the skills to take full advantage of their unprecedented access to rich, interesting “big” datasets. Recognizing that the promise is great but the associated challenges are real, Ocean Tracks aims to build a comprehensive, state-of-the-art educational tool that employs technology to reach broad student populations, while at the same time developing a concrete model for the field of how to bring data into the classroom in productive ways. 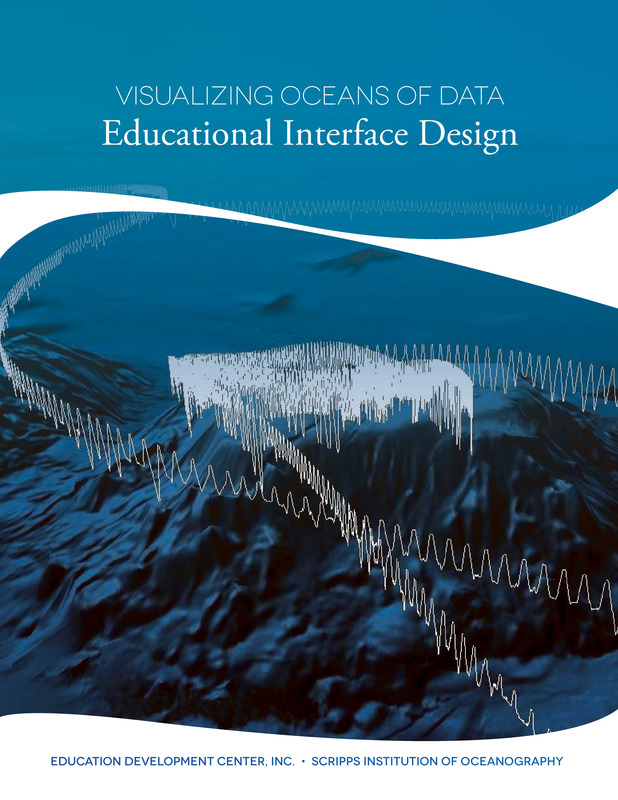 The Ocean Tracks interface was designed based on guidelines in Visualizing Oceans of Data: Educational Interface Design, with a goal of enabling students to engage in the critical scientific practices of developing questions, planning and carrying out investigations, and analyzing and interpreting data. Using the interactive map and data analysis tools, students can explore and quantify patterns in animal tracks by taking measurements, such as speed and diving depth, to support hypotheses about marine animal behavior. The interface then supports students in relating these behaviors to fluctuations and trends in physical oceanographic variables, such as sea surface temperature and ocean currents, using environmental data from Earth-orbiting-satellites and ocean drifter buoys. These interface features allow students to engage in investigations with the data that model those currently being conducted by scientists to understand the broad-scale effects of changes in climate and other human activities on these important top predators in ocean ecosystems. The Ocean Tracks interface is being developed as a collaborative effort between EDC, Scripps Institution of Oceanography, and Stanford, with key contributions from EarthNC (our web developer) and the Lifelong Learning Group at the Center for Research and Evaluation. The work has been funded by the National Science Foundation. The Ocean Tracks web interface and curriculum modules have been created using several grants from the National Science Foundation. The interface was developed and pilot tested with high school students in four classrooms during the spring and fall of 2013. In 2014, we were funded to make further refinements to the interface and develop curriculum modules for undergraduate students. The modules have been iteratively tested by 14 undergraduate faculty between 2014 and 2017, yielding interesting new insights into how working with data can develop data analytic and critical thinking skills. We are currently seeking funding to better understand the essential role teacher facilitation plays in developing students’ data literacy skills, and to broaden the reach and impact of the Ocean Tracks resources. For more information about EDC's Oceans of Data Institute, please see http://oceansofdata.org. To learn more about the Tagging of Pelagic Predators program at Stanford University, visit http://gtopp.org. The data found in Ocean Tracks come from a variety of sources. Animal tracking data are from the Tagging of Pacific Predators (TOPP) program, including Barbara Block (Stanford), Dan Costa (UC Santa Cruz), and Scott Shaffer (San Jose State University). Drifter buoy tracks were provided by NOAA's Global Drifter Program. Sea surface temperature and productivity overlays were provided by NOAA and NASA. The Human Impacts overlay was provided by Ben Halpern and the folks at the National Center for Ecological Analysis and Synthesis (NCEAS) at UC Santa Barbara. Currents maps were created by Rick Lumpkin at NOAA's Atlantic Oceanographic and Meteorological Laboratory. Ocean Tracks is based upon work supported by the National Science Foundation under Grant Nos. 1222220, 1222413, 1431903, 1431917. Any opinions, findings, and conclusions or recommendations expressed in this material are those of the authors and do not necessarily reflect the views of the National Science Foundation.